Samsung Galaxy S5 Home Screen Leak - Displayed in Tiled Format! Samsung Galaxy S5 Home Screen Leak – Displayed in Tiled Format! Samsung Galaxy S5 speculations and rumors are getting hot with every passing week. Seems like we are getting into the peak zone with this latest leak. The latest leak comes from the credible evleaks who has showed a possible TouchWiz home screen that might be introduced with Samsung Galaxy S5. The Galaxy S5 home screen seems to be completely different than the one in current flagships. 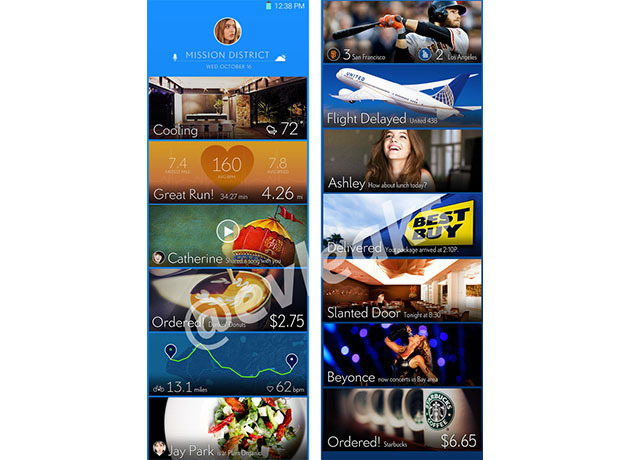 ‏@evleaks: More from that Samsung home screen. The Samsung Galaxy S5 home screen leak shows a tiled format similar to Google Now. The image displays info and notifications in the similar pattern too much like the Microsoft’s Modern / Metro UI. This latest Galaxy S5 home screen leak doesn’t share any details about how the information would be aggregated in such a format right on the home screen. If this Galaxy S5 home screen leak is credible or not, we will know for sure in coming weeks!